I have done some research where I found out that problem is probably related to MESA and MALI drivers. Moreover Octave doesn't run in GUI mode, which in my opinion is caused by the same reason as aforementioned problem. Octave run non-graphical commands just well in console mode. ODROID XU4 is running UBUNTU 16.04.3-4.14 (20171212) release from wiki.odroid.com. I really appreciate any help on solving this problem. "sudo apt install glmark2-es2" to test the Mali GPU driver functionality. BTW, try the latest Ubuntu 18.04 image if you don't mind. If Octave uses Qt5 library, you have to use the Ubuntu 18.04 image which has a built-in customized Qt5 package to enable the Mali GPU. Also check this thread too. ardexess wrote: ODROID XU4 is running UBUNTU 16.04.3-4.14 (20171212) release from wiki.odroid.com. The version of Octave used in Ubuntu 16.04 still uses QT4 which requires OpenGL, ODROIDs do not support OpenGL only OpenGL ES. The version of Octave used In Ubuntu 18.04 uses QT5 and you might have a chance that it's running on OpenGL ES cause of this. Yes, it works on Ubuntu 18.04. Thanks a lot for Your help. 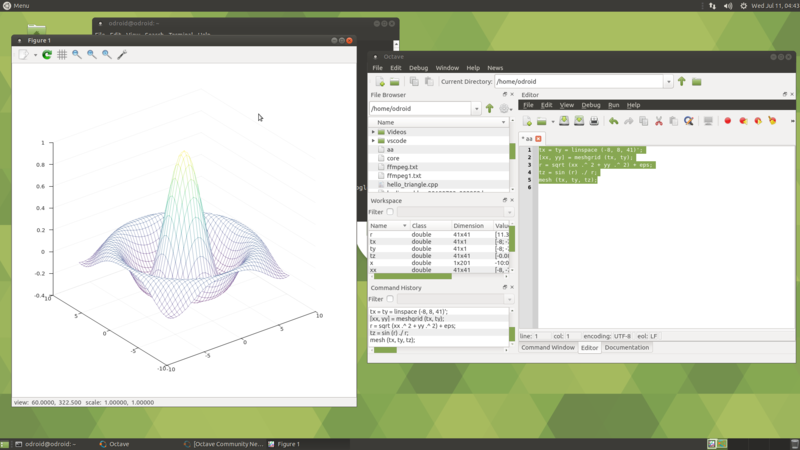 As You have suggested Octave (4.2.2) started in GUI mode under UBUNTU 18.04(20180501). However uicontrol still does not work. So now I have to figure out how to get these toolkits installed in Octave. I think Octave seems to utilize a Java engine here and there. Try to use the Java 8 from Oracle instead of the default OpenJDK. This is my first time to run Octave. I don't know how to enable/use the uicontrol. According to their wiki page, it seems to runs on "Qt" graphics toolkit. But I have no idea what "graphics toolkit" means. There is no "qt" option. It seems to be worth to try to build the Octave from source code on XU4. But it may take a couple of days probably. libraries are not available when Octave is built, gnuplot is used. According to the sentence system must have OpenGL to implement qt toolkit in the octave. So far as I know Odroid dedicated versions of UBUNTU use OpenGL ES. Maybe thats the problem. And maybe its possible somehow to utilize this OpenGL ES during build of Octave? That's just my loose observation, I'm not an expert in Unix systems. I will try with ppa:octave/stable. I think there is a solution to enable Qt5 toolkit while building the source code. I will try it early next week if I have a spare time. Did you create a couple of symlinks for Qt5Help in the proper directory /usr/lib/arm-linux-gnueabihf/? No. How to do it? Two symlinks were required in my case. Since the guide was written for x86 64bit platform, you need to change it for ARM HF platform. After installing a missing package, I could see an enabled Qt5 option in "configure" output. I am building Octave 4.4.0 now. Update: Build was successful. It looks better now. But I have no idea how to test fltk toolkit. We might need to investigate why qt doesn't exist in the list too. Don't make the symlinks. I didn't touch the libQt5Help stuff. Below steps were enough to build it again. Still no FLTK toolkit available. Warning: OpenGL libs (GL and GLU) not found. OpenGL graphics will be disabled. Can you run "es2gears" or "glmark2-es2" now? Did you install most of the necessary dependencies with this command? Yes these commands works. After installation of build-dep octave dependiences, configuraiton results looks much better (No FLTK error). However making and installing octave on previously installed octave (without theses dependiences) didn't work. I'm trying now again from clean system. Let's check one by one. Update the system after clean installing OS image. After rebooting, check OpenGL-ES functionality with a Qt example. Try that and let me know the result. You have to check the Octave version in UI menu Help -> About Octave. It must be 4.4.0. Something could be wrong in my record. I will freshly install OS image and try it again early next week since I have some urgent projects now. After force reinstalling "qttools5-dev" package sudo apt install qttools5-dev --reinstall, Qt5 GUI was configured well. I could run the GUI if I selected an icon on Menu -> Education -> GNU Octave. configure: WARNING: OpenGL libs (GL and GLU) not found. OpenGL graphics will be disabled. configure: WARNING: SUNDIALS NVECTOR serial library not found. Solvers ode15i and ode15s will be disabled. configure: WARNING: SUNDIALS IDA library not found. Solvers ode15i and ode15s will be disabled. configure: WARNING: JAVA_HOME environment variable not initialized. Auto-detection will proceed but is unreliable. configure: NOTE: OR if they are missing required features on your system. But, there was no "fltk" option even "fltk" build option was configured well. I regret I flashed the OS image to the working eMMC. I will try to find what was missing. I found what was wrong. But I am not sure whether the fltk toolkit works or not since I have zero experience of Octave. Ummm.. the fltk seems to support the OpenGL only instead of OpenGL-ES. OpenGL is not available on ODROID platforms. But it is very worth to try this OpenGL wrapper GL4ES. It may take less than 15 minutes. #Edit line 34 "#define DEFAULT_ES 2" to force GLES 2.0 to avoid mess with env. variables. Reboot your system and check the fltk functionality and let me know the result. you can't mix OpenGL and OpenGL ES. If Qt5 uses OpenGL ES, you can not run an OpenGL application in the same context. Fortunately, "uicontrol" seems to be a fully separated GTK/X11 application and it works well probably. I've just tested and it worked. After succesfull make of GL4ES I have still the same error. Shouldn't I have to install it somehow? You had to scroll down little bit to find sudo cp ./lib/libGL.so.1 /usr/lib/arm-linux-gnueabihf/.